Jill urges New Year resolutioners to stub it out! A smoking cessation specialist is urging people to kick their unhealthy habit in 2019. Jill Denton, who supports people from Kintyre and Mid Argyll in quitting smoking, wants more people to sign up to her free service. Supported by NHS Highland, she holds sessions in Campbeltown Library on Tuesdays and in Lochgilphead on Wednesdays offering support and advice. 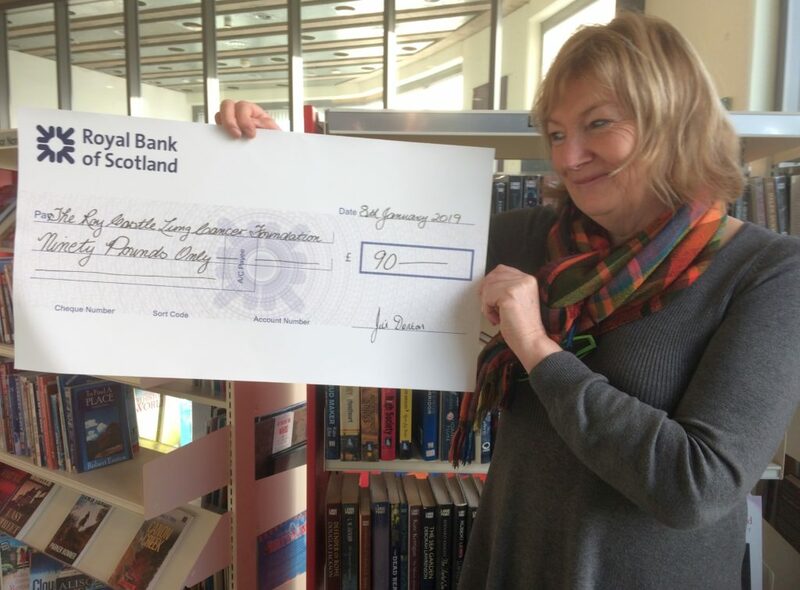 Jill recently presented a cheque for £90, from donations to a collection tin in the library, to the Roy Castle Lung Cancer Foundation, the only UK charity to focus solely on lung cancer care. As well as supporting those with the disease, the foundation invests money in researching the prevention and treatment of the illness. Founded by thoracic surgeon Professor Ray Donnelly as the Lung Cancer Fund in Liverpool in 1990, it was renamed after UK entertainer Roy Castle in 1993. Roy was diagnosed with the disease in March 1992, and having been told his chances of recovery were slim, agreed to raise £12 million to build, equip and run the new centre. Roy, a passive smoker who blamed his illness on playing the trumpet in jazz clubs, continued to fundraise for the charity until his death in September 1994, aged 62. His wife Fiona campaigned for the British smoking ban which came into effect in Scotland in 2006, banning smoking in almost all enclosed public places. As well as one-to-one support, Jill offers group sessions and telephone support for those who cannot attend meetings. To find out how Jill can help you stop smoking, call 07707 868351.